The white cliffs of Dover stands as a guard to the gateway of England. There are millions of people who pass the region and the place is famous for its white cliffs which are over 300 feet high. These white cliffs are a symbol in the area and it has been long immortalised in song and literature. This part of Britain was under water around seventy million years ago. Cocoliths which are skeletons of tiny algae has formed the bottom of the sea bed. It is this white mud with cocoliths which would become the chalk later on. The deposition of chalk happened very slowly with just about half a milimeter in an year and this is equivalent to about 180 coccoliths piling up one on top of another. These cocoliths are hardly seen by the naked eye and therefore need a microscope to view them . Looking closely one is able to find other sea animals such as shells, ammonites, sea sponges and urchins. In recent years the chalk has been lifted out of the sea by movements of the earth’s crust. The shaping of the beautiful chalk took place during the Ice Age. The final parts of the Ice Age saw the invasion of chalk by the English Channel, which made Britain to become an island. There are many fossils one might be able to find in the white cliffs of Dover. 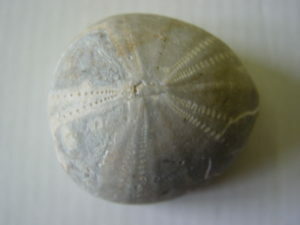 It is common to find a micraster echinoid among the loose beach pebbles. 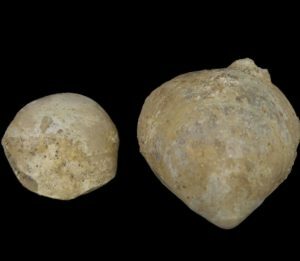 Further one could find Sternotaxis among the internal flint. Echinocorys echinoids could be found too and phymosoma which are echinoic spines seen on the surface of fallen boulders. 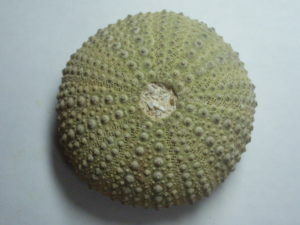 Also Temnocidaris echinoids, sponges, are generally found. One could also find fragments of Isocrinus crinoids, lamiform shark teeth, oysters and concinnithyris brachiopods. Inoceramid bivalues, impressions of spndylus bivalves too are found on the beach. The formation of white chalk is completely of calcium carbonate and it is purely limestone which is made of billions of microorganisms to include foraminifera and calcareous algae and rhabdoliths. These microorganisms today are found in the upper 300-600 feet of the open seas. Once these microorganisms die, the calcium rich shells accumulate in the ocean bed below the surface. It is estimated that these remains generally take at least 10 days or longer to reach the ocean bed and accumulates at 0.5 to 3 inches per thousand years. Evolutionists show that these chalk beds have formed over millions of years.